Hospital waste management has been brought into focus in India recently, particularly with the notification of the biomedical waste management and handling rules. The ministry of environment and forests, Government of India, notified the bio-medical waste management and handling rules on 27 th July 1984.These rules have been formed in exercise of the powers conferred by sections 6, 8 and 25 of environmental protection act 1986. (The Ministry of Environment and Forests, Government of India-Bio-medical waste management handling rules-1998). The rule makes it mandatory for the health care establishment to segregate, disinfect and dispose their waste in eco-friendly manner. Clearly, statutory safeguards for biomedical waste management practice in Indian hospitals have still not achieved the desired standards (Hegde et al.,  2007). In the last few years there has been rapid mushrooming of dental health care set ups catering the needs of people and thereby there is definite increase in the quantity of waste generated. Dental Hospitals generates waste similar to other health care setups which includes a large component of general waste and a smaller proportion of hazardous waste (Sudhakar and Chandrashekar,  2008). Biomedical waste generated in dental hospitals include sharps, body tissues, chemical fixers, mercury, silver thiosulfate, lead foils, fresh mix of amalgam, scrap amalgam etc., and used dental materials. To ensure compliance with the law, these materials must be properly handled, recycled, treated and/or disposed. But more often, in dental hospitals the general wastes and biomedical wastes are allowed to mix, thereby rendering the general waste also toxic and hazardous. Most dental hospitals are not actively involved in addressing this problem and also literature search show very limited scientific literature on the attitude among staff of dental hospitals about hospital waste management (Jugal et al.,  2000) (Saraf et al.,  2006). The most vital component of the waste management plans that have been formulated is to bring about a transformation in the mindset and develop a system and culture through education, training and persistent motivation of the health care staff (Chandrorkar and Nagoba,  2003). This study was conducted to assess the attitude towards hospital waste management among staff of dental hospitals in Bangalore city. The ethical clearance was obtained from the ethical committee of The Oxford Dental College, Hospital and Research Centre prior to the start of the study. All the required and relevant information regarding dental colleges that were approved/recognized by Dental council of India was obtained from their website. For the purpose of conducting this study cluster sampling procedure was adopted. Fifty percent of the total sixteen dental teaching hospitals, that is eight, is selected using random selection considering the constraints of limited resources like manpower, finance, and administrative logistics. These eight colleges constituted the cluster for conducting the study. A total population comprising of 228 Dentist, 32 Auxillary, and 76 Attenders were available from these eight dental teaching hospitals in Bangalore city. A specially prepared, and pre-tested structured questionnaire, was given to assess the attitude among the staff of dental teaching hospitals and collected personally. For Dentist and Dental Auxilliary the questionnaire was in English consisting of a set of 10 questions and for Attenders the questionnaire was in Kannada (local language) consisting of a set of 5 questions. Questionnaire took less than 10 min to answer. All the answers were kept confidential and were not depicted against their identity. The data so obtained from the study sample was compiled; systematized, tabulated and master table was prepared. SPSS version 15.0 (SPSS Pty Ltd, Chicago, IL, USA) was used for the statistical analyzes. For dentist and dental auxiliaries there were 10 questions regarding attitude. The option strongly disagree were given a score of 1, disagree 2, don't know 3, agree 4, strongly agree 5. So, the attitude score for an individual could range from a minimum of 1 to a maximum of 50. And for the negative questions, the scoring was done appropriately giving highest score for the right attitude. And for attenders there were 5 questions regarding attitude. The correct answers were given a score of 1 and the wrong answers were given a score of 0. So, the attitude score for an individual could range from a minimum of 0 to a maximum of 5. A total of 177 Dentists, 26 auxiliaries and 69 attenders agreed to participate from eight dental hospitals in Bangalore city. A total of 33.5% of dentists strongly disagreed that segregation of waste at source increases the risk of injury to waste handlers, 53.7% of them strongly agreed decontamination/disinfection reduces chances of infection at baseline and 50.2% strongly agreed that Infectious waste should be put in yellow colored plastic bag. A total of 69.9% of dentists strongly agreed that occupational safety of waste handlers is a must, 69.5% strongly agreed that the use of color codes for segregation of waste is a must and 71.4% strongly agreed to the statement "Post exposure prophylaxis should be initiated as soon as possible." A total of 60.6% of dentists strongly agreed that excess mercury/amalgam should be stored in water or fixer solution [Table 1]. 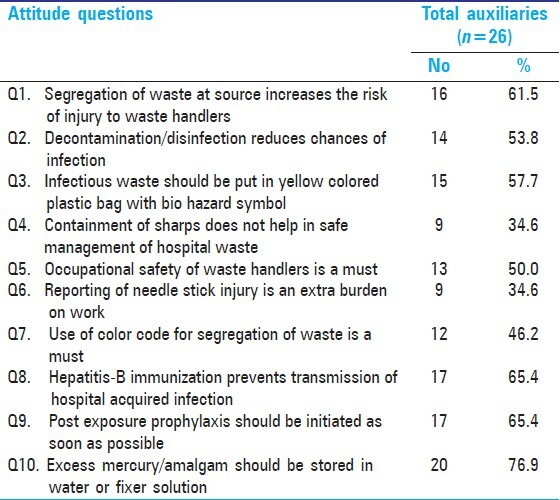 A total of 61.5% of auxiliaries strongly disagreed that segregation of waste at source increases the risk of injury to waste handlers, 53.8% strongly agreed decontamination/disinfection reduces chances of infection at baseline and 57.7% strongly agreed that Infectious waste should be put in yellow colored plastic bag. A total of 50% of auxiliaries strongly agreed that occupational safety of waste handlers is a must and 65.4% strongly agreed to the statement "Post exposure prophylaxis should be initiated as soon as possible." A total of 76.9% of auxiliaries strongly agreed that excess mercury/amalgam should be stored in water or fixer solution [Table 2] and [Table 3]. 82.6% of attenders said that it is necessary to segregate waste into different categories at the point of origin. A total of 23.2% of them said reporting of needle stick injury is not an extra burden on work at baseline. 53.6% agreed that segregation of waste at source does not increase the risk of injury to waste handlers. 55.1% felt it is necessary to take vaccination against hepatitis B. 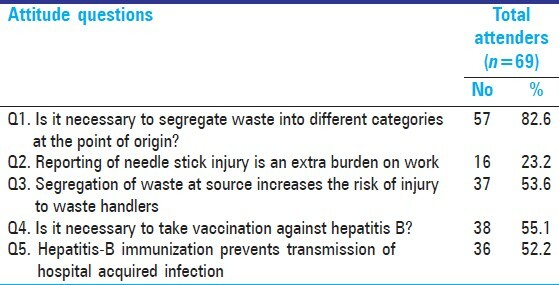 52.2% agreed that Hepatitis-B immunization prevents transmission of hospital acquired infection [Table 3]. Hospitals and other health-care establishments have a "duty of care" for the environment and for public health, and have particular responsibilities in relation to the waste they produce. It is ironical that the very hospital that brings relief to the sick can create health hazard for hospital staff, patients as well as the community at large. Safe management of health care waste becomes very important when it comes to environment conservation and health of the community (Pruss et al.,  1999). The onus is on such establishments to ensure that there are no adverse health and environmental consequences of their waste handling, treatment, and disposal activities. According to World Health Organization, "The human's element is more important than the technology. Almost any system of treatment and disposal that is operated by well-trained, and well-motivated staff can provide more protection for staff, patients and the community than an expensive or sophisticated system that is managed by staff who do not understand the risks, and the importance of their contribution" (World Health Organization,  2000). For effective management of hospital waste it is essential that personnel hold positive attitude towards care of the environment, occupational health and safety and teamwork. Hospital waste management has major attitudinal and behavioral components (Rasheed et al.,  2005). Literature search show poor knowledge, attitude and practices of biomedical waste management among staff and have reported that there is urgent need to train and educate all the staff, in order to adopt an effective waste management practice (Saini et al.,  2005). A chain is as strong as the weakest link in it, thus the entire staff involved in waste management at some point or the other should be trained properly. Before providing the training program, it is mandatory to understand the existing gaps and deficiencies in the study participants' knowledge, perceptions, behavior towards hospital waste management. Knowledge, attitude and practices of the personnel play an important role. Lack of these, even with good infrastructure and technology, is of little or no use in proper waste management. Knowing this, the training program can be aimed to make participants understand-environment friendly, healthy and economically viable in-house management systems, to ensure that the waste is carried responsibly from cradle to grave. Optimal waste management is at best, a moving target. Usually attenders are responsible for spearheading the waste management initiatives. Waste-handling is left to lower-level workers who operate without any training, guidance, and supervision. Managing waste requires effective management of people who produce the waste, not just those who handle it. It's primarily the dentists who are responsible for waste generation. But currently, as most of us are aware it is mainly the resistant attitude of dentists that is responsible for poor results on this front. Dentist at the high end of hierarchy should take this issue which needs to be addressed not as a burden difficult to bear. Proper management of dental hospital waste should be addressed with dignity, by concerted action as duty, and by no uncertain terms as responding to pressure. They probably should not do it because there is legislation, but they need to do it as they are also socially accountable. 1. Acharya DB, Singh M. The Text Book of Hospital Waste Management. Minerva Press; 2000. 2. The Ministry of Environment and Forests. Government of India-Bio-medical waste management and handling rules-1998. 3. Hegde V, Kulkani RD, Ajantha GS. Bio medical waste management. J Oral Maxillofac Pathol 2007;11:1, 5-9. 4. Sudhakar V, Chandrashekar J. Dental health care waste disposal among private dental practices in Bangalore City, India. Int Dent J 2008;58:51-4. 5. Kishore J, Goel P, Sagar B, Joshi TK. Awareness about biomedical waste management and infection control among dentists of a teaching hospital in New Delhi, India. Indian J Dent Res 2000;11:157-61. 6. Saraf Y, Shinde M, Tiwari SC. Study of attitude and awareness status about hospital waste management among personnel and quantification. Indian J Community Med 2006;31:111. 7. Chandrorkar AG, Nagoba BS. Hospital Waste Management. 1 st ed. Hyderabad: Paras Medical Publisher; 2003. 8. Pruss A, Giroult E, Rushbrook P. Safe Management of Wastes from Healthcare Activities. Geneva: World Health Organization; 1999. 9. World Health Organization. Suggested guiding principles and practices for sound management of hazardous hospital waste. New Delhi: Regional Office for South-East Asia, World Health Organization; 2000. p. 3-5. 10. Rasheed S, Iqbal S, Baig LA, Mufti K. Hospital waste management in the teaching hospitals of Karachi. J Pak Med Assoc 2005;55:192-5. 11. Saini S, Nagarajan SS, Sharma RK. Knowledge, Attitude and practices of bio-medical waste management amongst staff of a tertiary level Hospital in India. J Acad Hosp 2005;17:54-9. Srivastava, D.K., Bansal, M., Gour, N.,Chouksey, M., Pathak, P.